Five or more servings of these nutrients per week can lead to a healthier profile and protect you from disorders such as type 2 diabetes and heart disease. Five servings of nuts per week — or replacing animal proteins with nuts — is tied to lower inflammation. The higher the intake of nuts, the better, the study on 5, 000 people found. Biomarkers of inflammation are measurable indicators of the presence or the severity of some diseases, such as heart disease. “Population studies have consistently supported a protective role of nuts against cardiometabolic disorders such as cardiovascular disease and type 2 diabetes, and we know that inflammation is a key process in the development of these diseases. The research team knew about the relationship between increased nut intake and lower risk of major chronic diseases and even death. But the link between the amount of nut consumption and inflammation hasn’t been examined enough by large studies before. This study estimated nut intake, including peanuts and other nuts from food questionnaires. They looked at some inflammatory biomarkers in the participants’ blood samples and measured three well-known proteins related to inflammation: interleukin 6 (IL6), tumor necrosis factor receptor 2 (TNFR2) and C-reactive protein (CRP). After adjusting for some variables such as age, lifestyle and medical history, their data showed that participants who weekly ate five or more servings of nuts had lower levels of IL6 and CRP than those who never consumed nuts. Moreover, participants who replaced their red meat, eggs, refined grains, and processed meat with three servings of nuts per week had lower levels of IL6 and CRP. It is well-known that peanuts and tree nuts are rich in antioxidants, fibre, magnesium, α-linolenic acid, L-arginine and many other nutritious components. 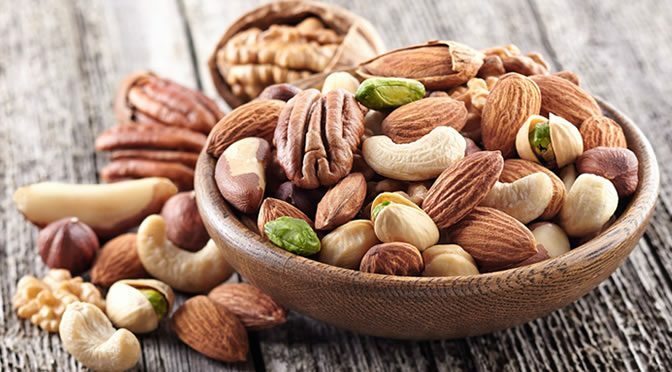 Dr Bao and her colleagues are now interested to find out if all or some of these healthful components in nuts have protective effects against inflammation. “Much remains unknown about how our diet influences inflammation and, in turn, our risk of disease. The study was published in the American Journal of Clinical Nutrition (Yu et al., 2016).